Our Annual Award ceremony will take place on Tuesday 23 October at 7.30 p.m. in the Liz Cantell Room, Ealing Town Hall, Uxbridge Rd, W5 2BY. The aim of the award scheme is to encourage and reward good design in the Borough. Eight projects have been shortlisted this year and the judges were Gavin Leonard, Anthony Ferguson and Harbinder Birdi. 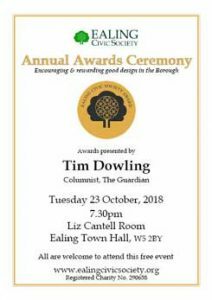 Tim Dowling, Guardian Columnist, will present the awards. All are welcome, so do come along and hear about some interesting and inspiring projects including an environmental centre made of straw bales, local schools, and contemporary house extensions.